Allan Yn Y Fan? A funny name, that. When I first got to hear of this bunch of five musicians causing mayhem at dances around the Gwent valleys, I always translated it as “Out In The Van” – which was quite appropriate for a busy little combo. That was harking back to 1996, and Allan Yn Y Fan have progressed from a twmpath group to a mighty band playing concerts at Glasgow’s Celtic Connections and the gigantic Lorient Interceltique in Brittany to successful tours of Germany, the Czech Republic, Ireland, France, Switzerland, Luxembourg and all the European stops in between. And Allan Yn Y Fan’s unflagging energy has received a welcome shot in the arm by recruiting two musicians, radiant singer Catrin O’Neill from Southern Snowdonia and expert fiddler Alan Cooper from the Brecon Beacons. The Gwent band celebrated a decade of recording four CDs and one EP with the release of a retrospective compilation entitled Cool, Calm and Collected – and Catrin and Alan have been joining the other four core members in Alan’s studio, recording yet another future CD. 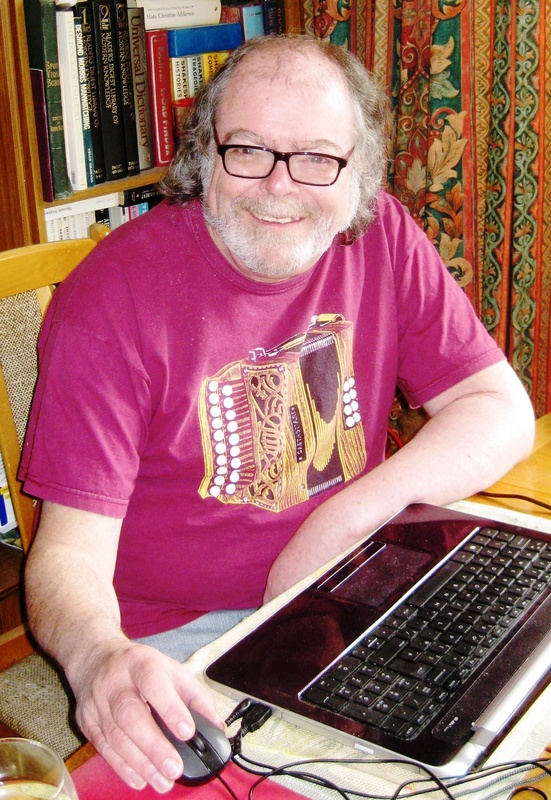 Allan Yn Y Fan are definitely going places – in fact, they were playing a string of concerts in Germany when I interviewed founder and leader Geoff Cripps. 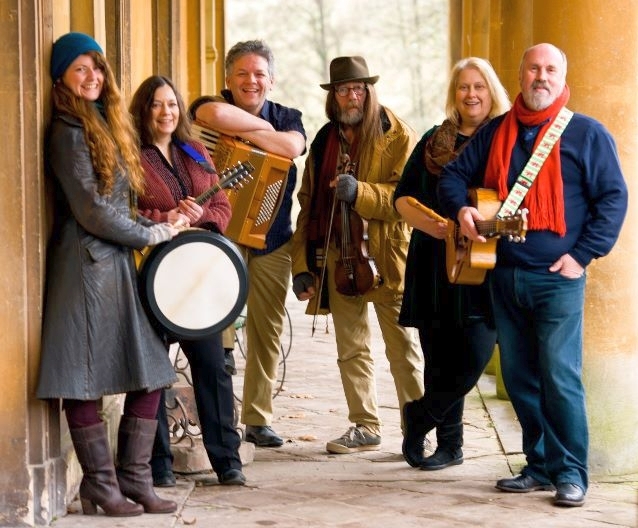 The four members of Allan Yn Y Fan – Geoff, Chris Jones (accordion, flute, low D whistle, vocals), Kate Strudwick (flute, alto-flute, recorders, whistles, vocals) and Linda Simmonds (mandolin, mandola, bodhran, vocals) – have been playing together for almost two decades. The gigantic steelworks that dominated the town of Ebbw Vale had closed, and in its place the controversial Garden Festival Wales was springing up. Linda, Geoff and Kate were working for the Festival, which was booking many spectacular acts to keep the thousands of casual visitors interested as they strolled around the vast site. It was there that Kate invited Chris to perform at several Festival events, and it wasn’t much longer before the four began to play together. Allan Yn Y Fan was born in 1996. All four members share a strong friendship and a mutual respect that tightens the bond. Geoff said: “With Kate and Chris, it isn’t just that they are proper musicians who did all the grades on the flutes and piano – but for me, it is also their skills at composition. The band has benefitted hugely from having two composers in the line-up – and I don’t think that the music they have made for the band has always received as much credit as it should. Meriel joined in 2008. Her enthusiasm, her pure voice and strong fiddle-playing were a new milestone for the band, culminating in the last recorded CD, Pwnco – featuring the Mari Lwyd horse tradition. So why did she leave? Now Catrin and Alan are safely embedded in the band, and Allan Yn Y Fan has moved a considerable notch further. I saw the band at Tredegar House International Festival, and they generated so much vitality and power that could light half of Newport. Catrin shone as lead singer, and her magnetic presence just demanded to be noticed. Alan drew on his experiences with Juice and many other bands to produce really quality bowing. The four others jumped into the cooking-pot of scintillating sounds; bubbling, happy accordeon, driving mandolin and beautiful flute shored up by rock-solid guitar and bass. The whole band were eager to show the audience their new repertoire, and the audience loved it. Catrin comes from Aberdyfi in Southern Snowdonia – thus, comments Geoff, single-handedly demolishing the supposed north-south divide in Wales. She was introduced to the magical storehouse of Wales’ traditional songs by her Nain, her Welsh grandmother; her solo album, Cegin Nain/Nain’s Kitchen, is strongly reminiscent of Nain’s influence. Catrin spent many years travelling, living and playing abroad, while attempting to introduce everyone she met to the joys of Welsh folk music. She came home to Wales in 2007, where she became part of a successful folk trio with harper Chris Knowles and fiddler Mike Lease. The influence of her Irish ancestry and love of Breton dance and its music can be heard in her performances – but her true love lies in the music of Wales. She has become a member of the successful TRAC project 10 Mewn Bws, which caused a great commotion in Welsh music circles, was nominated for a National Lottery award in 2014 and gained a four-star award in FolkWales Online Magazine’s CD reviews. Alan comes originally from Tintwistle, a little village that used to be in Cheshire but for some reason is now in Derbyshire. His musical journey began with classical violin, but he started playing folk-style fiddle from his early twenties. He played fiddle with Juice, another of Wales’ leading dance bands, and also toured internationally in a variety of settings. He has been working recently as a duo with Blaenavon musician Dan James, with whom he regularly tours Brittany. One advantage is that Alan owns his own home studio – and Allan Yn Y Fan, ever ready to seize their chance, have been busy recording a new album. In the decade between Allan Yn Y Fan releasing their debut album and the latest compilation, a lot of water has flowed under the bridge since then. Has the band forged a definite path for the Welsh tradition? Geoff is grateful for the complement: “Like most performers, we have always wanted to share our music with the broadest audience possible. We have had some great reviews over the years for both the quality of our arrangements, as well as for our original compositions. We did always look to take Welsh music onto the festival stages in England and Scotland, and in recent years have toured into Germany, the Czech Republic, Switzerland and Luxembourg. Geoff is pleased that Catrin and Alan have become members: “We feel that it’s re-energised us as a band. I don’t think that there will be a radical new direction, but there is already a change in the sound with Catrin’s vocals and bodhran playing – a different playing style to that of Linda – and Alan’s exquisite fiddle sound. 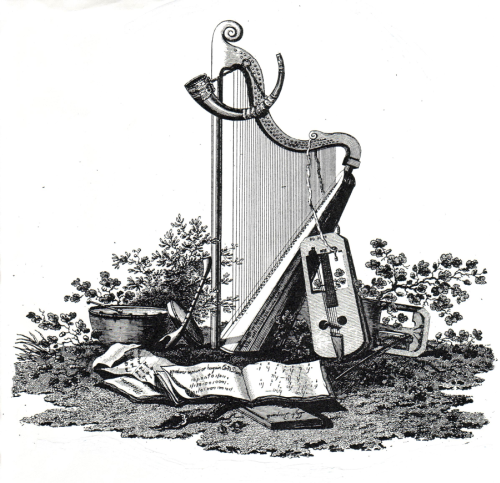 We will still be re-imagining traditional Welsh songs and music whilst Kate and Chris compose original material for us to arrange and perform. And Allan Yn Y Fan are joining Calan, Jamie Smith’s Mabon, The Gentle Good and other Welsh musicians in beating down the door and demanding to be noticed. 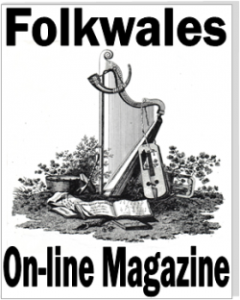 Geoff says: “In recent years, the folk world has slowly woken up to the distinctive attributes of Welsh traditional music and song. At the moment it seems to me that the profile is slightly higher than the previous peak in the 1980s, when Calennig, Pedwar Yn Y Bar, Mabon, Bwchadanas, The Chartists and Ar Log were all active. 2 spiders will have 16 legs, unless they’ve lost some, which isn’t uncommon. Mick, it’s nice to discover what you’re up to – please add me to any communications that you are throwing out there.